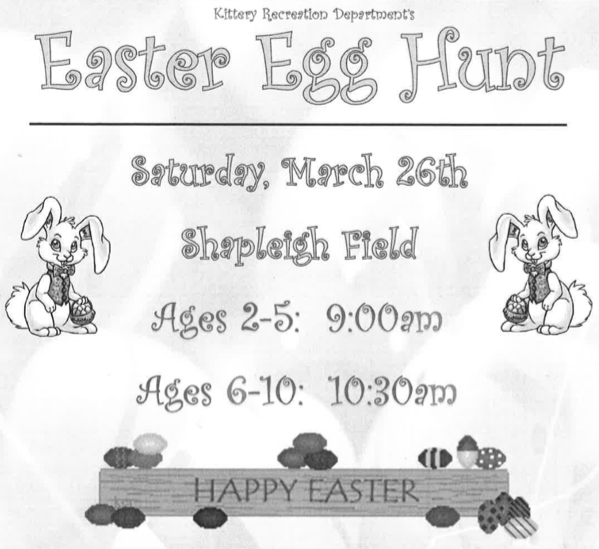 The Kittery Recreation Department is holding a free Easter Egg Hunt for children age 10 and under this Saturday (March 26) at Shapleigh Field. Bring the family down to hunt for Easter eggs, meet the Easter Bunny, and have fun. Children ages 2-5 will hunt for Easter eggs at 9am, and for kids ages 6-10 at 10:30am. Parental supervision is mandatory, and no preregistration is required. This event will be cancelled for inclement weather. For more information, contact the Kittery Recreation Department at 207.439.3800.